The latest in fast and affordable weld cleaning technology from the leaders in the field. This single unit will clean stainless steel, brass and bronze after they have been welded with TIG, MIG or MMA electrodes. 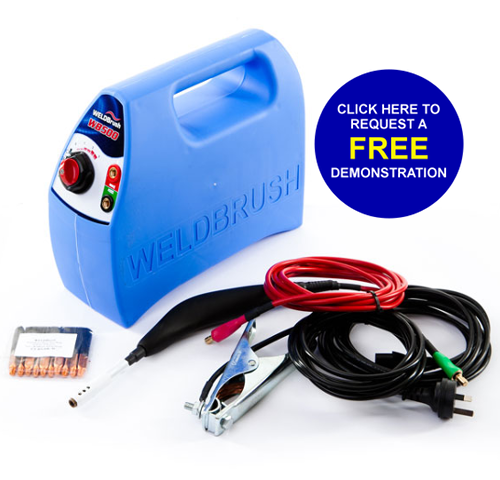 This fast and inexpensive WELDBrush is compact, rugged, acid resistant & easy to carry. The patented sliding white shroud at the end of the wand not only protects the shell of the brush from shorting in confined spaces, but also restricts the splay of the brush by concentrating the cleaning power into a smaller, better defined area. Accessories and replacement parts are also available.